It has been requested that this article be rewritten and expanded to include information for Mario Tennis Aces. Experience Points (usually just referred to as Experience, or abbreviated as Exp., EXP, or XP) are units of measurement used in role-playing video games to quantify the progression of a playable character through the game. The RPGs of the Mario franchise generally award these points for defeating opponents in battle; RPGs of other franchises may also award them for completing quests or overcoming obstacles. When a sufficient number of Experience Points is obtained, the character Levels Up, earning increases to statistics such as their health, attack power, or special-moves capacities. As characters gain levels, the amount of Experience Points needed to reach levels increase, making it more difficult to level up. In general, enemies encountered at the beginning of a game drop less Experience Points than those found later on. Bosses and rarely-encountered enemies can drop a significant amount of Experience Points when defeated. When a character reaches their maximum level, Experience Points do nothing for them, and whatever Experience Points collected after that are not distributed to other characters. In Super Mario RPG: Legend of the Seven Stars, Experience Points earned in battles are divided up between the party members (halved if there are two, in thirds for three), and are displayed as such on the victory results screen: if the player's party earns 30 Experience Points from a battle, "10 Exp." will be displayed. Characters can also receive Experience Points from battles, even if they did not participate in them; they would earn the same amount as those in the player's current party. The player can purchase the Exp. Booster Accessory to double the amount of Experience Points only for the party member wearing it. If the player gets a Game Over in battle, the player is sent back to their last Save Point while still retaining any new levels, Experience Points, Coins, and items gained. The player also has a chance to double their Exp. earned at the end of a battle from the "Wheeere's Yoshi?!" minigame if they successfully get the Baby Yoshi from one of the three eggs shuffled around. A party member can collect a maximum of 9,999 Experience Points, bringing them to the maximum level of 30. Experience Points are still divided up regardless of how many party members have already reached this level. In the original format of the Paper Mario series, Experience Points are called "Star Points", but their purpose is unchanged. In Super Paper Mario, Points serve as EXP. In Paper Mario: Sticker Star, EXP is absent. In Paper Mario: Color Splash, Hammer Scraps serve as EXP for increasing paint supply. The earned Experience Points in Mario & Luigi: Superstar Saga + Bowser's Minions for both characters is added to their total. 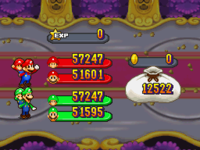 In the Mario & Luigi series, the total Experience Points earned in battle is applied to all characters, effectively doubling, tripling or quadrupling the amount actually earned. If a character is KO'd when a battle is over, they do not earn any Experience Points at all. In Mario & Luigi: Bowser's Inside Story and Mario & Luigi: Bowser's Inside Story + Bowser Jr.'s Journey, when the Mario Bros. fight enemies inside Bowser's body within the same battle he is, the Experience Points earned between them is separate. In Puzzle & Dragons: Super Mario Bros. Edition, XP earned in battles are divided up between the teammates on the player's active team: the less teammates the player has on their team, the more XP each teammate earns. If the XP divided between the teammates ends at a decimal point, the value is rounded up. As with Super Mario RPG: Legend of the Seven Stars, XP is divided up between all members of the player's team regardless of how many have already reached their maximum levels. The player can also provide XP for their teammates by depowering other teammates in the player's Ally Box for their XP in the Power Up spot at Toad Houses. Depowering teammates removes them from the player's Ally Box and up to five allies can be depowered at a time. A teammate can provide more XP for another the higher their level is, with their base XP value multiplied by their current level. Teammates getting an ally's XP receive 50% more if their main attributes match. Coin Coffers and King Coin Coffers provide a significant power up for teammates using this method. Occasionally, a teammate may earn twice as much XP from another teammate than normal. This page was last edited on April 20, 2019, at 19:58.